Getting supplies to the children at the Eben Ezer School is difficult. Shipping a single barrel costs $150. On a plane, we can carry only one suitcase for free weighing no more than 50 pounds. Mail is not an option. This month we are loading a 40-foot container that can take basically as many pounds as we want. It is our chance to send a desk, bicycles, batteries and hundreds of other items that will make life easier for the students in our school in Haiti. 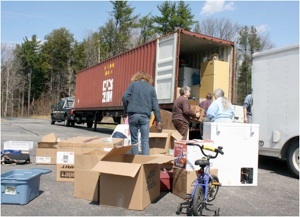 We will be packing the container with donations from 10 TO 2 pm SUNDAY, JUNE 1 at the Eliot Common. If you can't make this but have a donation, please let us know. Before then we will be loading a 1000-pound planer, tools, solar panels, and other items paid for by grants from the South Berwick -Eliot and York Rotary clubs. A 40 kw generator weighing more than a ton is already in the container, which is also be purchased and shipped by the Rotary grant. Here is our wish list. **maps -- at least one good set of world maps, free standing, not wall mounted. Also, a laminated world map for each classroom, or at least several classrooms. **Geometry supplies: rulers. protractors & compasses. We took some in Feb, but we could use many more. **1-3 sewing machines (with a pedal). . .. one of the teachers will teach sewing. There is great interest in quilting. **electric stove/oven for the kitchen. The current one uses gas, which is very expensive. Please remove as much packaging as possible and pack in boxes, not bags if you can. And if you have extra boxes please bring them along. This is an exciting opportunity. 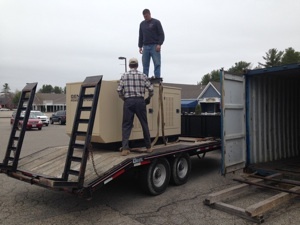 Attached is a picture of the loading of the last container in 2010 and the generator being loaded into the 2014 container. Come be part of this wonderful effort!